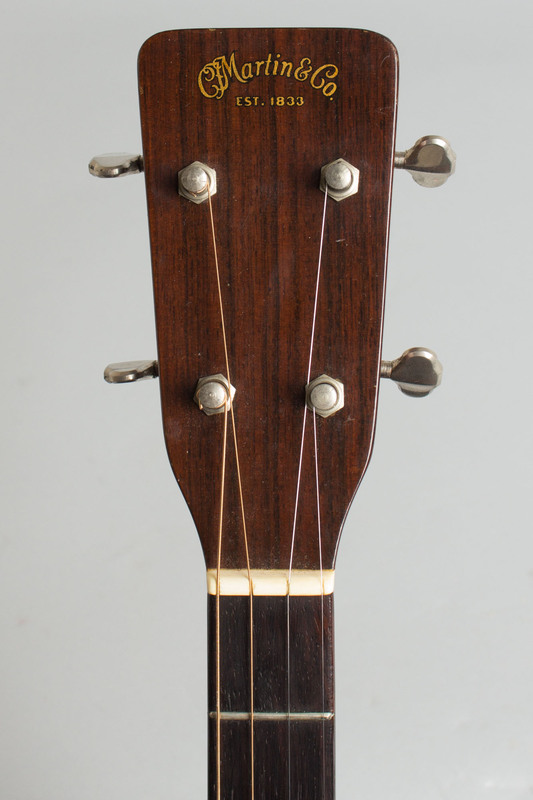 C. F. Martin 0-18T Model Flat Top Tenor Guitar (1962), made in Nazareth, PA, serial # 185625, natural lacquer finish, mahogany back, sides and neck, spruce top, rosewood fingerboard, original black chipboard case. 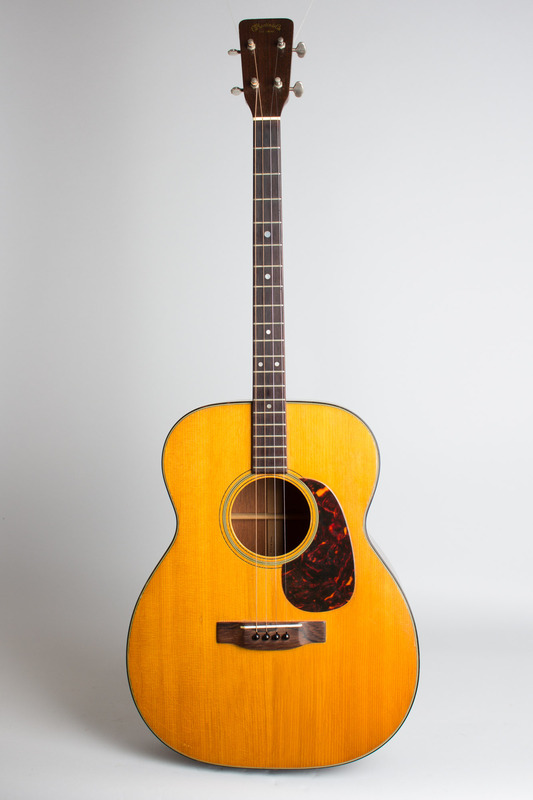 The Martin 0-18T is likely the most popular tenor guitar ever made, and this is a good playing example from the tail end of the "folk" era, still built in the original factory prior to the company's 1964 move. 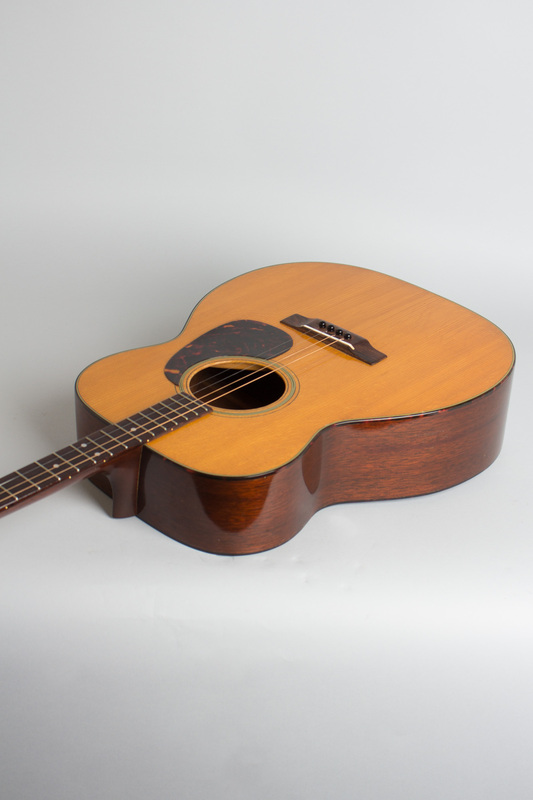 Typical features include a spruce top, mahogany back and sides, rosewood belly bridge and fingerboard, teardrop celluloid pickguard, and 14 fret 23" scale neck. 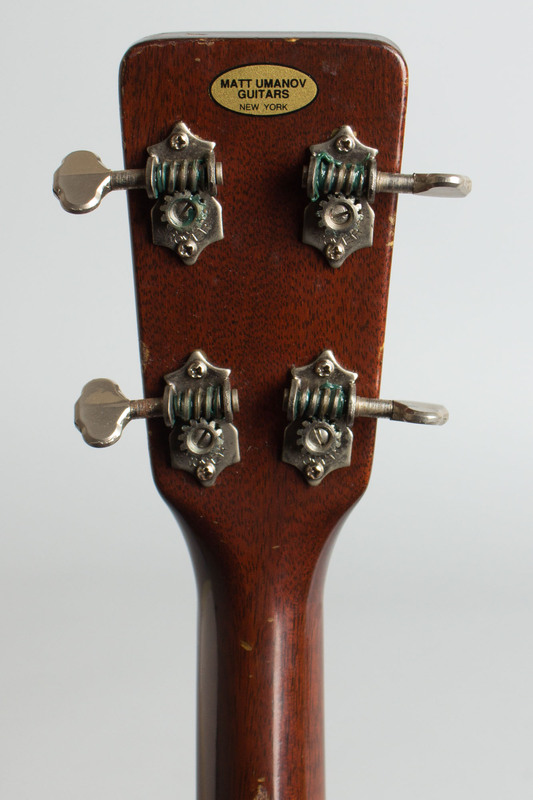 The Brazilian rosewood-faced headstock has a small "C. F. Martin" decal logo and open back Grover Sta-Tite tuners. While designed in the late 1920s for tenor banjoists getting pushed out of work by the preference for the guitar's mellower tone, tenor guitars have a range of possibilities still not fully explored. 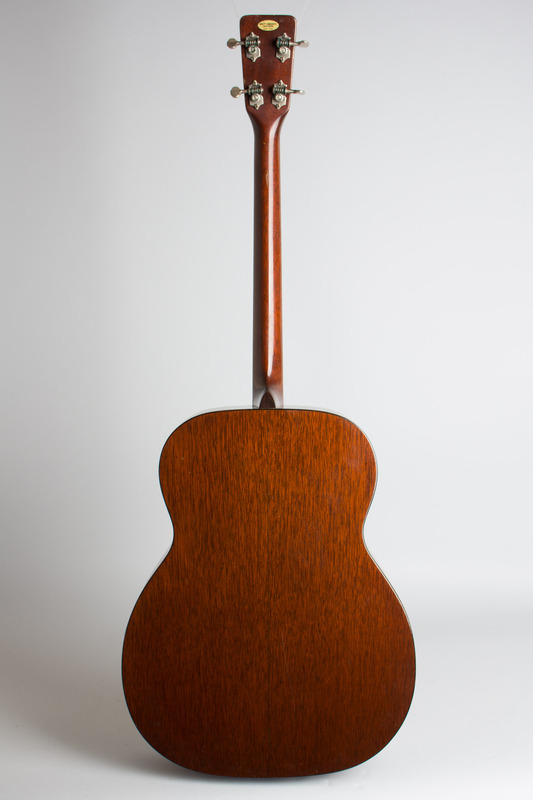 Rabon Delmore used small tenor Martin models including the 0-18T to play the deftly picked leads that characterize the Delmore Brothers' music, and many others have explored them since. 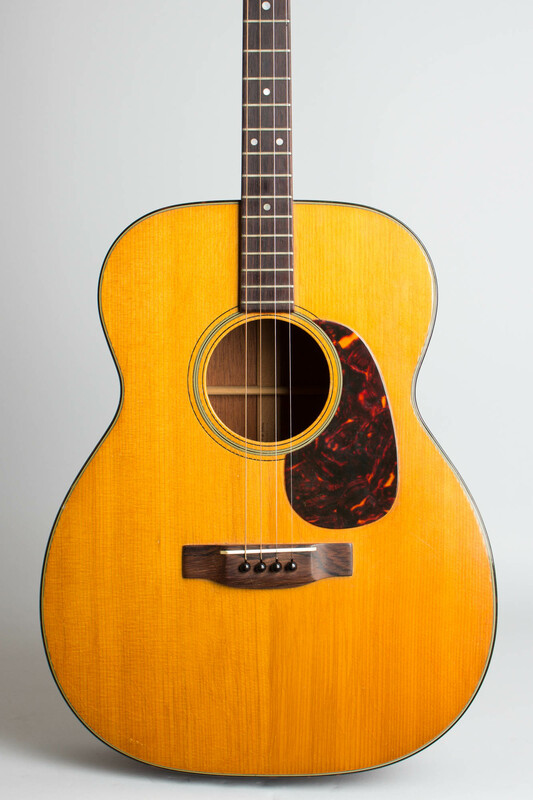 The Martin tenor was recently enjoying a big upswing in popularity when this one was built in the early '60s due to the influence of the Kingston Trio, who used this model extensively. Overall length is 35 1/2 in. (90.2 cm. ), 13 1/2 in. (34.3 cm.) wide at lower bout, and 4 1/8 in. (10.5 cm.) in depth at side, taken at the end block. Scale length is 23 in. (584 mm.). Width of nut is 1 1/4 in. (32 mm.). This is a nice, clean, original example overall, with some light wear and a few discreet repairs. There are two sealed top grain cracks, a small repair to the bass side just below the waist, and the bridge appears to have been reglued. The saddle has been lowered a bit but the bridge has never been cut down; the neck angle and frets are quite good. 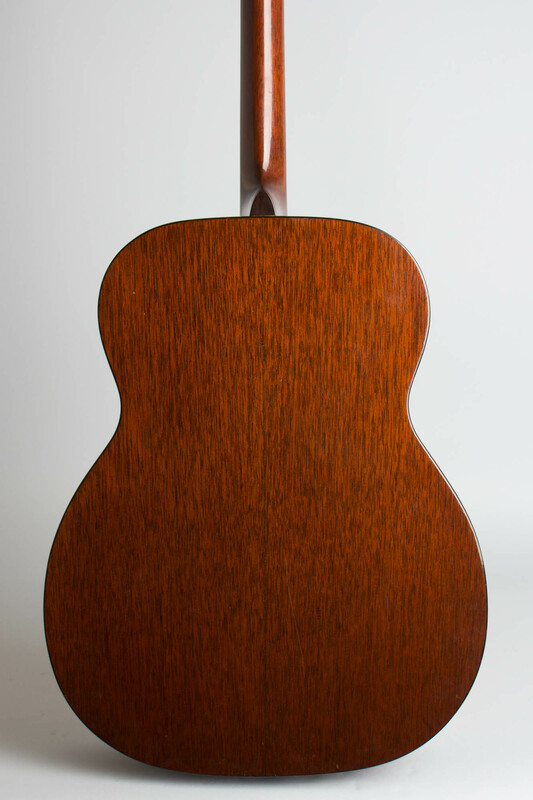 This is a fine player; a good example of Martin's most successful 4-string complete in the original higher-grade chipboard case. Excellent - Condition.